H. W. "Buzz" Bernard is a best-selling, award-winning novelist. His books include a number-one Kindle bestseller and two EPIC eBook award winners. His novels in chronological order are: EYEWALL (the bestseller), PLAGUE (an award winner), SUPERCELL (the other award winner), BLIZZARD, and CASCADIA. 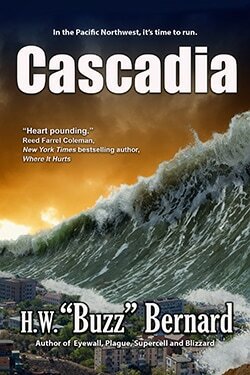 CASCADIA, his newest thriller, is a drama set against a disaster that WILL happen: the mega-earthquake and tsunami that loom for the Pacific Northwest. Buzz is working on novel number six now, an historical thriller centered around a legendary forest fire that ravaged northwest Oregon in 1933. With a background in atmospheric science and a keen interest in geological disciplines, Buzz is a natural to write dramas focused on weather and earthquakes. It turns out he’s also a natural at writing novels—though he points out he still had to learn the craft—and currently serves as president of the Southeastern Writers Association.